Interests: strutting, eating grass, showing sheepdogs who is boss and rock music. Meet Bam the Ram, the toughest baby ram in all the land! Born the leader of his heard, Bam struts through life with a handsome pair of horns and the confidence to match! 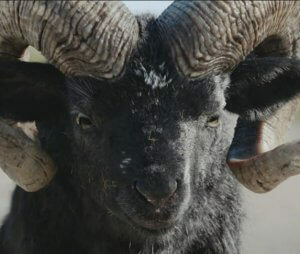 He faces off with a farmer, a sheepdog and even a bull; but even Bam gives way to the T-Roc when he comes accords the new SUV on the road. While this woolly winner was #BornConfident, there is only one equal to Bam, the new Volkswagen T-Roc which was also born to take the lead in its class. The T-Roc drives into the SUV segment confidently, just like our fuzzy hero it“stands out from the crowd and leaves a lasting impression” (says Jurgen Stackmann, member of the Volkswagen Management Board). While the T-Roc is VolkswaVgen’s smallest SU to date, it boasts the same practicality of an SUV with the agility of a sporty compact. Bam and the T-Roc might be small, but they definitely pack a punch! Are you #BornConfident? Stand out from the crowd with the new Volkswagen T-Roc, available to test drive in Sunderland and Durham now. Click here for more information.